Instagram allows companies to tell a visual story. Engagement is high, because Instagram plays to the fact that A) Most people usually have their phone in hand nowadays and B) Short-attention spans find a photo-based app an easy way to process information. With companies only recently investing in the Instagram for business field, it can be hard to know what kind of content will resonate with followers. There is always the fear in trying, failing and having that account as a permanent reminder of the posts that failed to get any love. Below you’ll find a compilation of what content is building rapport with followers, and examples from many well-known businesses both large and small. Look to the examples I’ve found for inspiration on [how to get more followers on Instagram, meaningfully engage with them and in return, induce them to engage with you. If you’ve read my posts, you’ll know businesses that incorporate user-generated content in their social media marketing strategy get a gold star from me. Social media is all about engaging with your followers- what’s a better way to get someone involved then by putting the spotlight on them? Your content should be customer-centric, always! When posting to Instagram, think before you hit the ‘Share’ button- what value does this add to my customers life? How do they benefit? Why would they be interested? How can I make this relevant to my followers? Always be thinking of your product/service in terms of benefits for your customer and in turn, always be focusing your marketing content on those benefits too. The best photos to choose are those that show your product in use, which is free advertising with a helpful co-sign from the follower who posted it. This keeps users interested in checking your profile to see if their photo gets chosen or to see if their friend’s photo does. 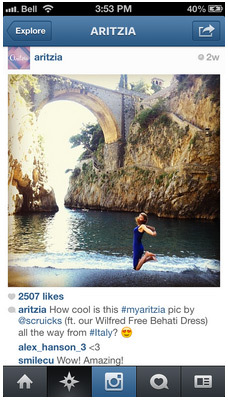 Aritzia organizes it’s user-submitted photos with the hashtag #myaritzia. As you can see below, they recently reposted a shot of a follower in Italy, wearing one of their dresses and jumping for joy in a nature setting. Aritiza is so enthusiastic about encouraging their followers to get involved, they even put it in their bio! Pictured below, it reads: “The Official Artizia Instagram. Show us what you’ve got by tagging your #ootds with #myaritzia and you might just get #regrammed. Aritzia is a great example of the mindset that companies on Instagram should have, which is a focus on encouraging follower participation. Our next example shows how Holt Renfrew thanked their customers following a sale, after they shared their finds using the hashtag #HoltsSale. What Holt Renfrew did was validate their customers by following up with a thank-you, expressing their great customer service. 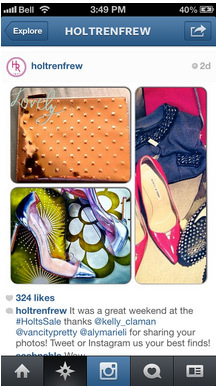 This post also promotes their sale to followers by showing them the ‘finds’ of past satisfied buyers. 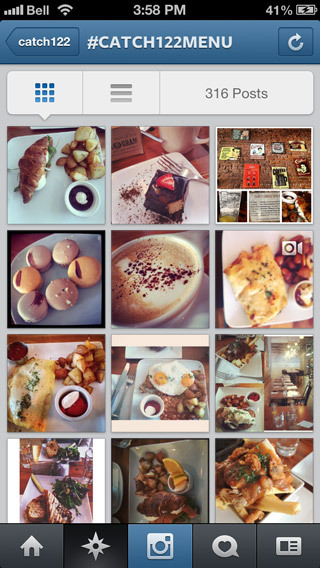 Chic eatery Catch 122 in Vancouver, BC is trying something new- getting their customers involved with their social media strategy. 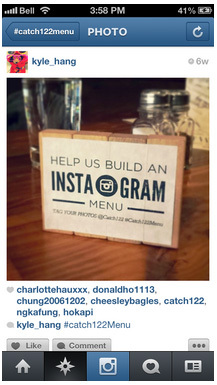 At every table, there is a small sign reading “Help us build an Instagram menu. Tag your photos @catch122 #Catch122Menu”. When the hashtag #Catch122Menu is searched, 316 posts to date are found (The small restaurant opened up only a year ago), all with delectable looking snaps of their various menu items, often along with a description and glowing testimonial. This is the new word of mouth (WOM) advertising- create a great product in today’s day and age and you can sit back and let your customers do the talking for you (with some gentle encouragement, of course). Pottery Barn emphasizes their relationship with customers by using the hashtag #mypb to find and repost follower’s photos. 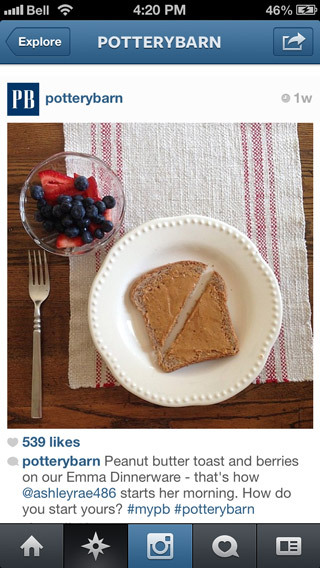 Below, a plate they sell is shown off in style by a user who posted a picturesque view of her morning meal. Best of all, Pottery Barn found a way to include other users still- by ending the caption asking followers “How do you start yours?” (referring to their mornings). End your captions with a question to encourage the social aspect of social media. 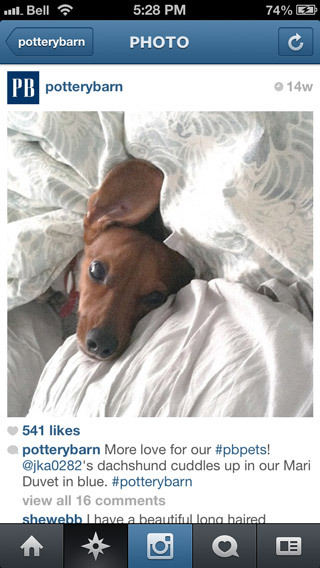 Instagram (and really all social media) users know that animal photos are extremely popular. Animal lovers feel a personal connection with their pets, and Pottery Barn capitalizes on this with their hashtag #pbpets. Find a common theme that works for your business and promote this niche as your account’s unique promotion on Instagram- other common hashtag examples include Lululemon’s #justmymat and Home Depot’s #HDHacks. Search them on Instagram for further inspiration! Social Media is all about enhancing your brand by showing off a brand personality. Putting faces to a name is key- no one wants to engage with a faceless corporation. Best of all, it’s a great way to connect with your followers. They get to see that hey, your staff is just like me! Companies that treat their employees well are much more desirable. Think about it this way: why do most clothing stores ask employees to dress in their product? Because it adds credibility to the brand and increases the appeal tenfold. Just as customers are more likely to seek an opinion from a sales representative that seems approachable and knowledgeable followers on Instagram are more likely to be interested in a brand whose employees embody their brand’s personality. You understand then that to know how to get more Instagram followers becomes particularly relevant to your business. Don’t just focus on your employees as product models however, focus on who they are- their personalities, their work spaces, events in the workplace such as team building exercises, birthdays, even just a typical inventory count, etc. Personal connection is key, as Instagram is all about an instant look into what is going on at the moment. Followers love to get an ‘exclusive behind-the-scenes’ look, such as a catered luncheon at work, a photoshoot, any of the inners going on at the time (especially good if seasonal/pop culturally relevant). This strategy keeps your content interesting- different looks, locations, people, events, etc. Best of all, it makes your company relatable and therefore memorable. Did you treat your workers to a great lunch? Snap a pic! Who’s running your social media? Buying your merchandise? Working hard in your office to get things done? Organizing big events? These are the things customers have always wondered about and now can see, with the help of social media. Transparency is always something to strive for and has increasingly become the expectation. Plus, employee satisfaction is sure to rise when publicly applauded for their work. 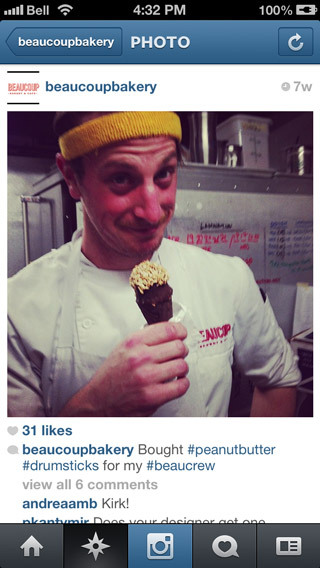 Beaucoup Bakery owner Jackie Ellis shows off the camaraderie she shares with her team by posting a photo of a member of what she terms her #beaucrew enjoying the peanut butter ice cream cones she bought for the entire staff. This is such a nice way to show what happens behind the scenes and build rapport with customers. There is a universal appeal in an employer who treats their employees well… as well as in peanut butter ice cream! This approach can increase your employee satisfaction in the same way that having a photo posted to a store wall for the “Employee of the Month” does. This ties a personal connection in for your employees, who will be more inclined to become a part of your social media circle as well- they can potentially share this type of post with friends to increase it’s popularity and the chance it will get seen by even more people. 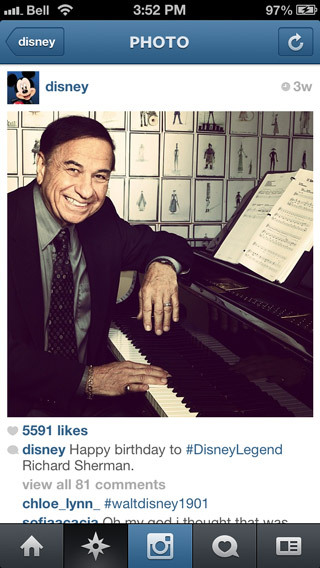 Global giant Disney wished former Disney employee Richard Sherman a Happy Birthday with a classic photo posted to their Instagram. Use of emotions, particularly nostalgia, is a big driver of engagement and very popular content on Instagram. Disney is very astute about adding a personal touch to their promotions in order to connect with each member of their follower base. One of the most popular trends on Instagram is the hashtag #TBT otherwise known as “Throwback Thursday” where users post photos from the past to reminisce. Remember this when planning your own posts, and use nostalgia to increase follower engagement on your account. Does your staff compete in any sports as a team? 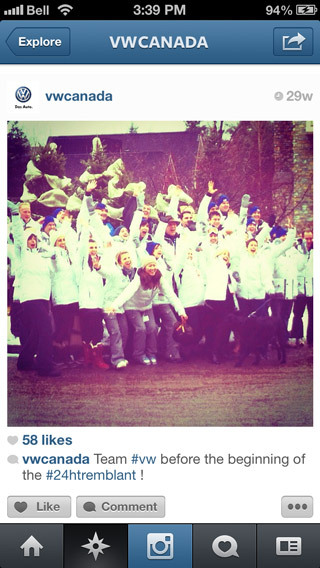 Volkswagen Canada shows their enthusiasm for team sports with their staff in the post below. It states “Team #vw before the beginning of the #24htremblant!” (The 24hr Tremblant is a skiing event that fundraises on behalf of foundations supporting children’s initiatives). 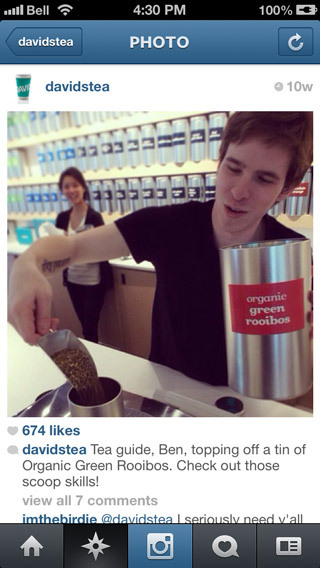 If your company practices corporate social responsibility, Instagram is a nice way to show it off. Do you recycle cans and bottles? Volunteer as a team? Attend charity fundraisers? Learn how to use Instagram to let your followers know that you are a company that cares. While I caution not to make it the only type of employee-centric post used, having a regular feature showcasing your staff interacting with your products is an engagement-driver and an effective sales promotion. As a retailer, you can easily post some staff style, or the staff using your products. As a tech company, show your employee’s trying out your latest product/service. Encourage discussion by asking followers to caption photos, or compare photos side by side and asking followers which they prefer. Followers interested in your product will definitely follow up with questions and you should encourage this by having your employees identified in the post. Have the employee follow up on their own social media account or (better yet) via the company account. Shown below, Miz Mooz flaunts their staff style with three staff members shown wearing the same shoe, in different hues. Presenting options is a great way to get followers to engage, by having to choose one ‘favourite’. Starbucks is well known for their fantastic social media strategy. Their strength is in the fact that they are a global company and use social media to make it their brand feel personal and small-scale. Here is a great example of how they personalize their social media using employee-centric posts. 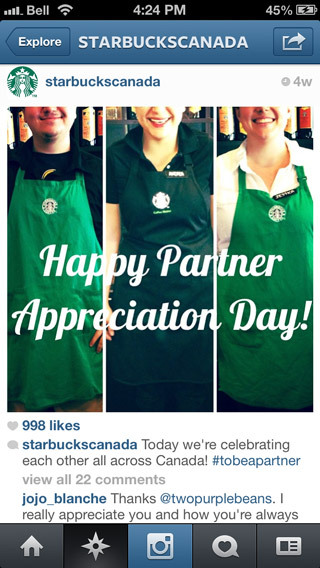 Their “Partner Appreciation Day” (‘Partner’ is what they call their employees) is celebrated with the Instagram post below. 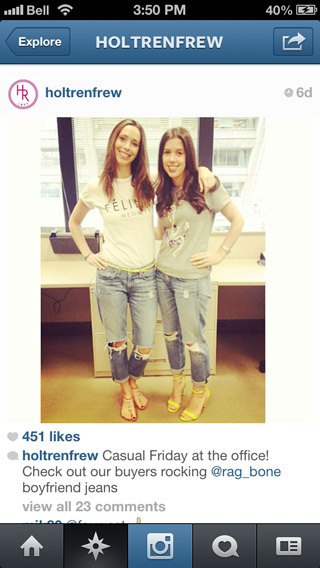 Holt Renfrew shows off the people behind the product with their post captioned “Casual Friday at the office! Check out our buyers rocking @rag_bone boyfriend jeans”. Contests are a huge engagement driver. With Instagram, it is so easy for followers to get involved in a contest and to stay involved with contest updates. 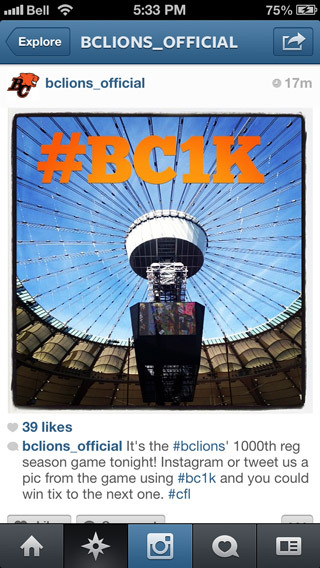 The BC Lion’s rewarded their fans with a contest using the hashtag #bc1k to celebrate their 1000th reg season game. Attendees were invited to Instagram a pic from the game and tag it with the hashtag #bc1k to win tickets to the next event. The great thing about contests is that the prize does not have to be extravagant or go beyond the company’s means. A prize as low as a $50 gift card to the gift store for example, can get the true fans excited and engaged. 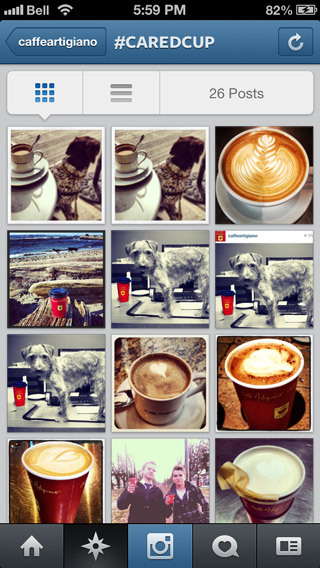 Caffe Artigiano used the hashtag #caredcup for it’s “Caffe Artigiano Red Cup challenge” to get it’s cafe-goers involved. Asking followers to participate in a contest to submit photos featuring your product increases engagement by your main core base - those who actually purchase your products. Caffe Artigiano is receiving some great product promotion in return for offering participants the chance to win a $15 gift card. 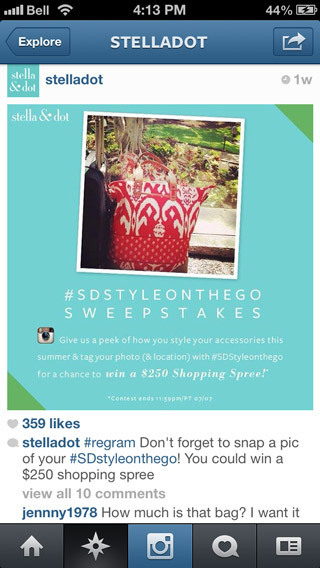 Stella & Dot created a branded image to promote their #sdstyleonthego Sweepstakes. The image reads “Give us a peek of how you style your accessories this summer & tag your photo (& location) with #SDStyleonthego for a chance to win a $250 Shopping Spree! 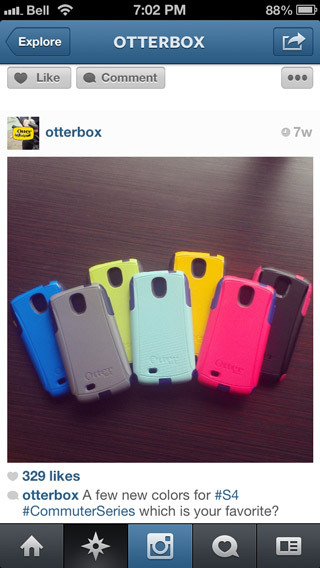 Instagram’s visual medium means pics that focus on colour and/or print stand out exceptionally well. Something as simple as lining your product up and showing it off in all available colours is surprisingly popular on Instagram. Let’s look at Holt Renfrew again for a great example of a colour story product post. 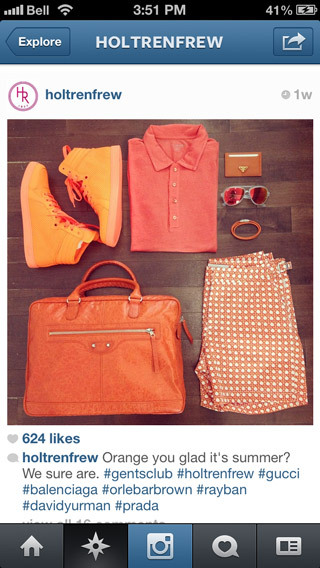 The above pic shows a full Men’s outfit featuring the colour orange, captioned “Orange you glad it’s summer? 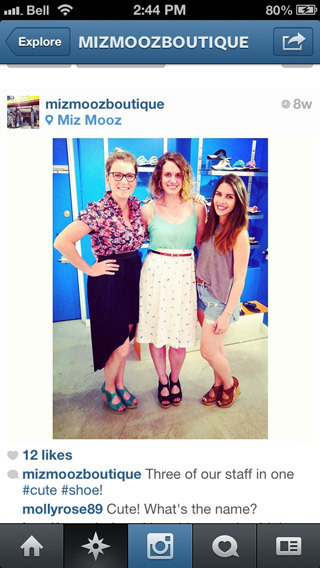 We sure are.” The caption includes hashtags of the names of the designers whose clothes are featured. 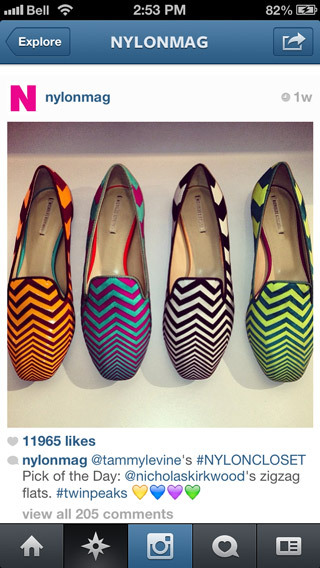 Below, Nylon Mag shows off Nicholas Kirkwood flats in four funky colours. The product speaks for itself, with that dazzling print receiving 11,955 likes. 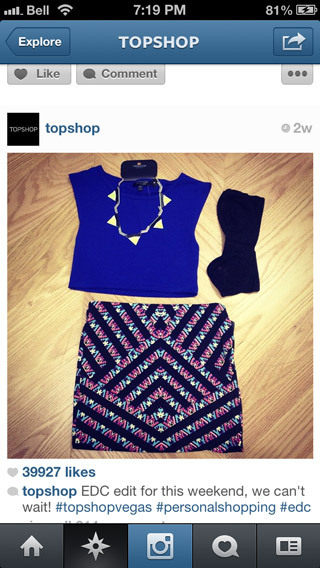 I really like the above post by Topshop, which puts an outfit together for a music event taking place in Vegas. The post reads “EDC edit for this weekend, we can’t wait! #topshopvegas #personalshopping #edc”. The reason I like this so much is the hashtag #personalshopping, which Topshop uses often. Putting together product pairing for your followers is smart advertising and this hashtag creates the idea that Topshop personally curated the look just for each individual follower. It may seem a circuitous route, but I stress the importance of putting the emphasis on a focus that is not just the company and it’s products. We have looked at making your customers and employee’s the “star” to display brand personality, now it’s time to give focus to those who act as your brand models. A blogger adds credibility to your product as a form of celebrity testimonial. Varied content keeps your posts interesting and having a regular feature such as a blogger like Tj Maxx’s “Maxxinista” (a play on the word fashionista) draws follower engagement. Popular bloggers have their own fan base so bloggers can cross-promote your Instagram posts and your brand’s products to a wider audience. Below, blogger Helena (@BrooklynBlonde1 on Instagram) is shown wearing a Tj Maxx blazer styled three different ways. Her Instagram account has 74,000 followers who saw her original post, much more than Tj Maxx’s 26,000 followers in comparison. This type of alliance is an evolved version of word-of-mouth and brand advocacy. The caption above reads “Maxx Style Scout @BrooklynBlonde1 dressed down this blazer 3 ways. #maxxinista”. 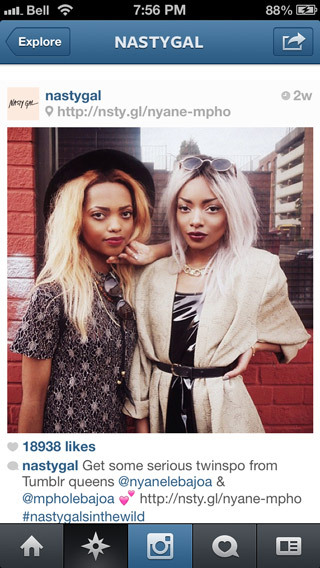 Nasty Gal’s post featuring twin Tumblr darlings Nyane Lebajoa and Mpho Lebajoa received nearly 19,000 likes and 300 comments. Nasty Gal is leveraging their appeal to drive engagement for Nasty Gal’s Instagram account. Bloggers have their own distinct voice, which translates well to increasing public intrigue and can lead to your product being promoted in ways your company may not have even thought of. A blogger can style a product in such a unique way that their version of “How to wear” becomes the new it look. Likewise, tech bloggers often find useful apps and expose the best ways to get the most use of out the product. 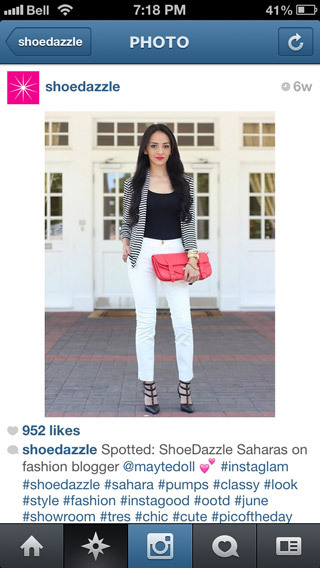 ShoeDazzle’s caught on to the trend and regularly features fashion bloggers on their Instagram account. These type of promotional photos work very well on on Instagram’s visual platform and followers will like and comment if the picture, the styling, the product, etc is to their liking. Promotional photos that resonate with the audience will receive instant feedback. Instagram focuses on the here and now- what’s hot at the moment, what’s going on at the moment and what will be happening in a few minutes from now. This is something to bear in mind when you think of how to get more followers on Instagram. Are they getting a sneak peek at an upcoming product? Seeing what it’s like ‘behind-the-scenes’ or gaining knowledge about the company or it’s employees? Getting to participate in a dialogue about something that intrigues them? Becoming the focus of the post? Ask yourself what the post does in terms of the customer, not the business, before you decide to post. Yes, it is great to be aware of Instagram as an advertising tool, but companies who focus solely on this aspect will find low engagement on their account. 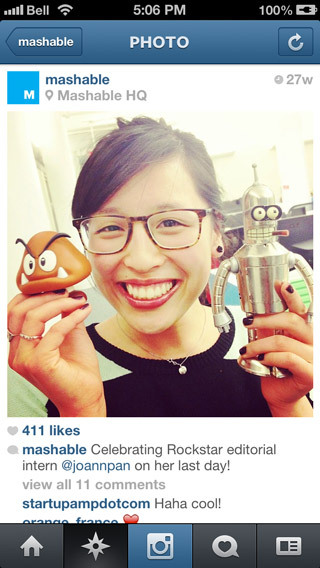 Engaging on Instagram is very easy for users. Once in the app, the only (in-app) calls to action are to like and comment. Everything is done without the need to switch windows (as an example of hassle that reduces engagement) and the beauty of Instagram is that it is primarily a mobile app. Most people have their phones in hand constantly and so due to that and the fact that most posts are uniform in that the photo is the focus (no distracting lengthy texts nor changes in formatting), engagement is quite high. For those with short attention spans (the majority of the population), Instagram is the perfect medium. Use the above examples to enhance your company’s appeal on Instagram and see your engagement soar.